James Bond 25 is getting another rewrite. This movie has been through the wringer at this point. Spectre came out more than three years ago and, by the time this movie actually hits theaters, it will have been four and a half years between installments in the franchise with the same actor, Daniel Craig, in the role. But things are finally moving in the right direction as some filming has already started and the bulk of the work is just around the corner. Before that happens, Phoebe Waller-Bridge has been brought in to punch-up the script. According to a new report, the Solo: A Star Wars Story actress and Fleabag star/writer is going to take a pass at the movie's script. 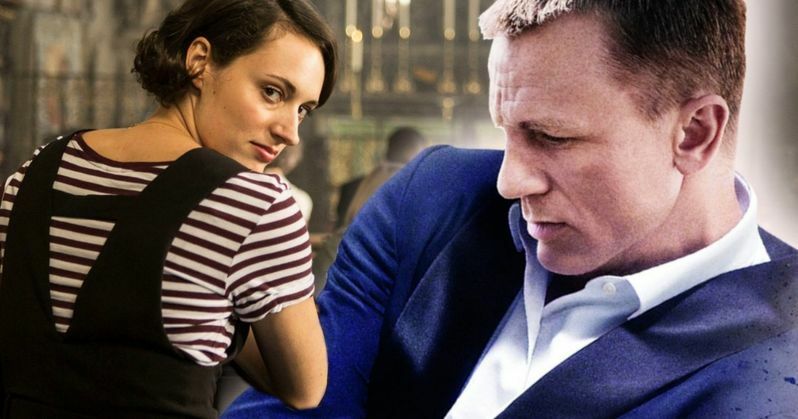 Apparently, Daniel Craig met with Phoebe Waller-Bridge after she performed a live version of Fleabag in New York, then specifically requested that she do the rewrite. Apparently, Craig thought it needed some "polishing." Waller-Bridge, who has earned acclaim for her work on Amazon's Fleabag and her work on Killing Eve as a writer, will try and bring some of her signature humor to the story, whatever it may be. At this point, the script has already passed through many hands. After Danny Boyle departed the project over creative differences, Cary Fukunaga (True Detective) was hired to helm the long-gestating project. At that point, the script John Hodge (Trainspotting) had written for Boyle was thrown out and franchise regulars Neal Purvis and Robert Wade were brought back in to write a new script. Then, Scott Z. Burns, writer of The Bourne Ultimatum and known Hollywood script doctor, was brought in to do an overhaul on their screenplay. Now Phoebe Waller-Bridge will take a pass at it. All of this to say, it's been very difficult to get things right on this one. This is set to be Daniel Craig's last turn as 007 and he's dead set on getting it right. Considering that the reaction to Spectre, both critically and from moviegoers, wasn't nearly as warm as it had been for Skyfall, it's understandable that Craig would want to do his best to make sure this movie can allow him to go out on a high note. Recently, some filming took place in Norway. However, that was just for one specific sequence. Other pre-production work is currently underway in Italy, Norway, Jamaica and Pinewood Studios, with the bulk of filming expected to begin very shortly. Little is known about this movie, other than the fact that Rami Malek (Bohemian Rhapsody) will play a villain, who is rumored to be blind. There was also a mysterious masked baddie in some leaked set photos from that first round of filming. We should expect the usual Bond press conference announcement, which will provide us with the official title and full cast, very soon. James Bond 25 is set to arrive in theaters on April 8, 2020. This news was first reported by The Guardian.